What better way to start our first case review for the iPhone 5s than with Apple's official case for it, the amply named iPhone 5s Case. 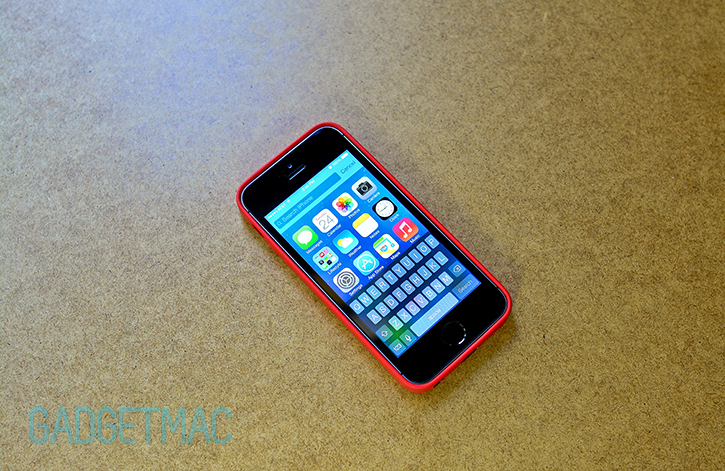 And unlike Apple's iPhone 5c Case we reviewed, this one hasn't fallen victim to cyber bullying and name calling. Why? Because Apple wasn't as daring with the iPhone 5s Case as it was with its perforated iPhone 5c Case, and it kept things very basic to an utmost minimalist of design. Made from what Apple calls "premium" non-Italian leather, each iPhone 5s Case features nothing but a slimming design made to encapsulate your iPhone 5s with your choice of six, dye-infused leather colors and a bill for $39. 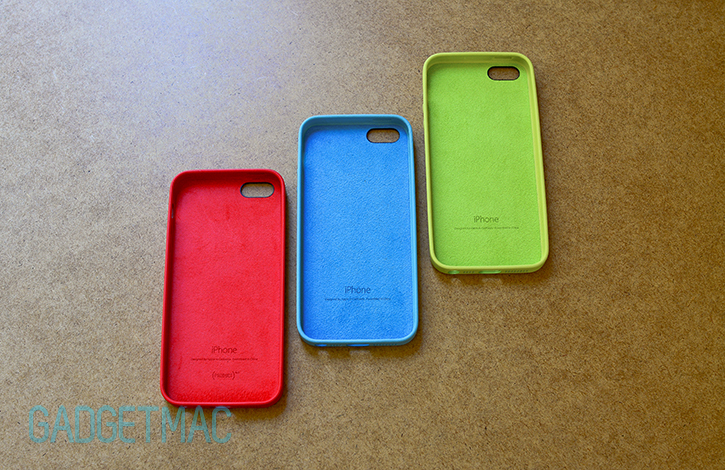 What makes Apple's official iPhone 5s Case different from all the rest? Can Apple beat some of the best leather case manufacturers on the market with its one and only leather-made iPhone 5s case? Find out in our full review after the cut! Packaged in slightly more elaborate see-through box-shaped packaging compared to the capsule-like packaging of the iPhone 5c cases, the iPhone 5s Case will set you back $39 - which is $30 less than Apple's leather Smart Cover and $10 more than the polyurethane iPhone 5c Case. 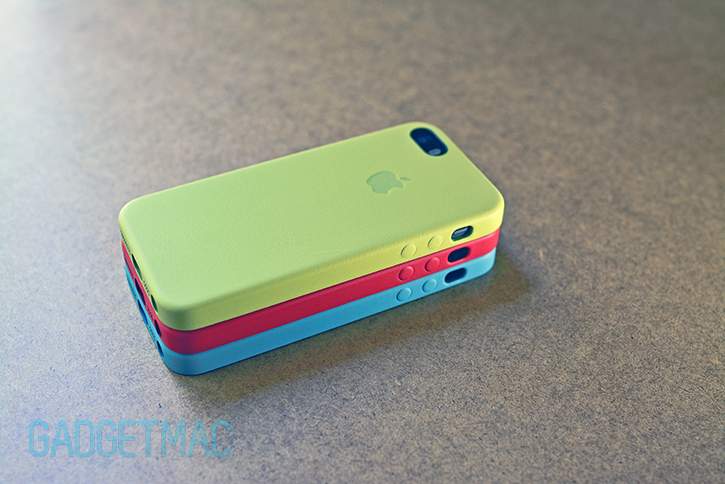 Available in three vibrant and three conservative hues, Apple's color selection for both of its iPhone 5s and iPhone 5c cases is somewhat on the pastel side of the spectrum. And that's not necessarily a bad thing, because every single color Apple picked out for its leather cases seems to have paid off. 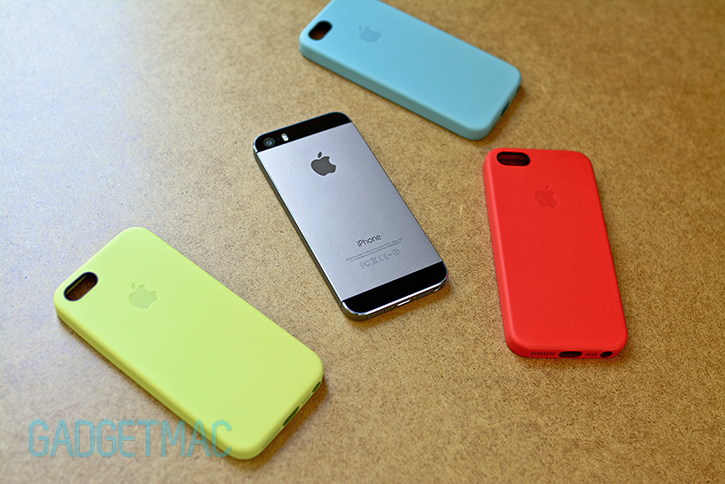 Each color looks fantastic on the Space Gray iPhone 5s. Suffice it to say, the same applies to the Gold and Silver iPhones too. 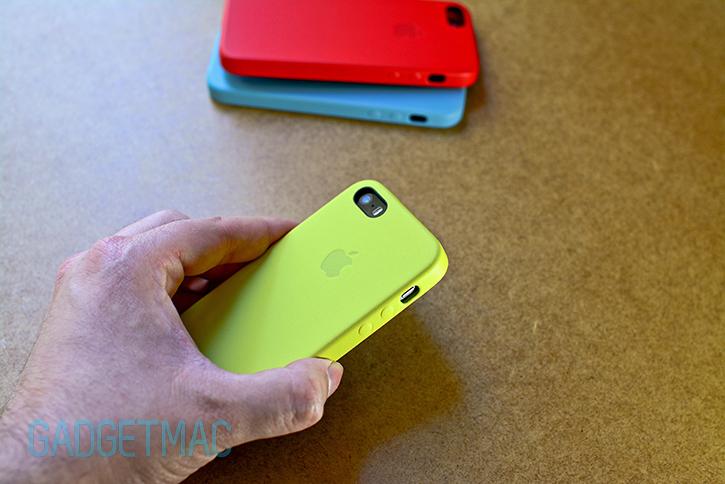 For reference, we're reviewing the blue, red (also known as Product RED) and yellow colors. 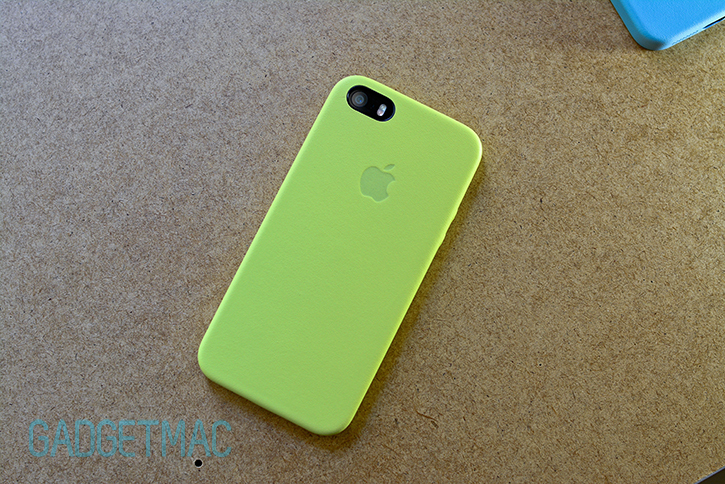 Albeit, the yellow is more of a lime green in case you wanted a more specific detail input on this particular shade. The blue is a light blue and the red is a pure, bloody bold red just like Apple's leather Smart Cover and Smart Case for the iPad. To be honest, Apple's light blue colored iPhone 5s Case isn't as good looking in person as the rest of the color options available for said leather case. I personally much prefer the blue shade Vaja uses for its Top Flip leather flip-style case for the iPhone 5s and iPhone 5. Since we're already this up close and personal, the leather Apple uses for this case is called "aniline" leather which as you can tell has natural-looking leather grain texture that feels smooth to the touch, but doesn't feel as luxurious as you might expect. Because the leather here is very thin, it has no supple characteristic to it and just feels very hard. The structure of the case itself is also extremely rigid, lending to the hard shell-type of a feeling you get when using it. For comparison, Apple's leather Smart Cover has the same exact rigidity to it as the iPhone 5s Case and also shares the same build quality which is seamless and simply excellent. The aniline leather not only has a natural dyed grain, it smells more natural too unlike a brand new leather jacket. That's because this leather isn't covered with a paint or pigment coating allowing the pores of the leather to show through the dye, and thus the leather is more susceptible to marring which Apple says will occur with use. And that's something you actually want to happen as it looks like you've actually used it, but you may want to pick up the more muted colored iPhone 5c Case cases if you want the leather to have a more pleasing and natural change of appearance. It's worth noting that the leather does tend to turn a darker color particularly around the corner and edge areas where friction is most common. Black and brown leather colored cases would wear best over time if that concerns you. As with all of Apple's accessories, they don't match the qualities of their premium devices but rather compliment them and we can only assume that Apple isn't focused on creating the next best high-end case like many other third parties are and have been for the longest time. The iPhone 5s Case obviously doesn't compare to the more luxurious leather cases that Vaja and other manufactures make nor does it make you think that it's a high-end piece of leather craftsmanship, but we shouldn't forget that there is a considerable difference in price. And even though Apple's $39 iPhone 5s Case may seem pricy, it isn't considered that expensive when considering other cases made by well-known leather case manufacturers. In case you weren't aware, Apple's iPhone 5s Case isn't exclusive to the newly released fingerprint sensor-boasting iPhone. That's right, the iPhone 5s Case is fully compatible and will also fit the now obsolete iPhone 5 just as well. 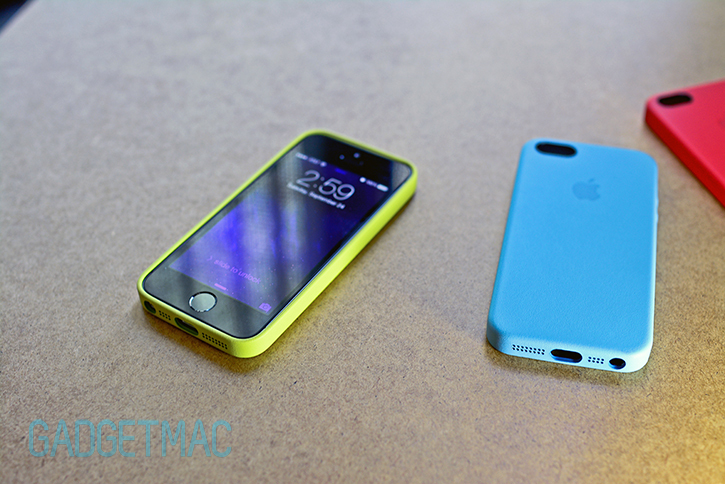 In a nutshell, the iPhone 5s Case shares many design similarities with the silicone rubber-made iPhone 5c Case. The only differences are of course the materials, rounder edges and a circular see-through pattern around the back. Starting with the interior, the iPhone 5s Case features a velvety suede material lining that completely covers the interior so that your iPhone won't get scratched, because that would just be ironic wouldn't it. Installing the case is a matter of side-slipping your iPhone into the button-side of the case while snapping in the rest of the iPhone into the case. However, taking it out can be a little tricky but not anything to worry about. The fit is very tight which is great because you don't want things falling apart in case you drop your iPhone on the ground, so you'll need to work around the case as you pull the corner edges off of the iPhone. Unlike the iPhone 5c Case, the iPhone 5s Case isn't as flexible hence why it's more difficult to remove. It may be a simplistic leather case, perhaps the most minimalist of them all, but once the case is on you won't want to take it off. The way it fits the iPhone 5s and compliments it as it surrounds the display and aluminum bezel with a slim profile that adds a beautiful color accent similar to the iPhone 5c Case is really aesthetically attractive and one that matters most when you spend most of the time starring at the front of your device and not the way around. This sort of design also let's users use any screen protector including tempered glass screen protectors. There is however, a tiny gap left between the case and the iPhone's aluminum bezel leaving just enough room to trap small debris that might fall in-between the case and the device which could lead to scratching or scuffing. But until that happens, we really can't say for sure whether that will evidently happen as the case does have a very stiff form factor all around the perimeter of the device with little to no play. It's worth mentioning that by comparison, the silicone rubber iPhone 5c Case tightly sits flush against the edges of the iPhone leaving absolutely no gap between the case and bezel. The iPhone 5s Case's leather-covered hardshell will provide a minimal amount of protection against drops while of course keeping the iPhone scratch-free in your day-to-day usage. It keeps a low-profile yet provides the necessary edge protection around the iPhone 5s' glass display using a minimal and well-rounded lip periphery in case you were to rest the device on its face or were to drop it on the ground. 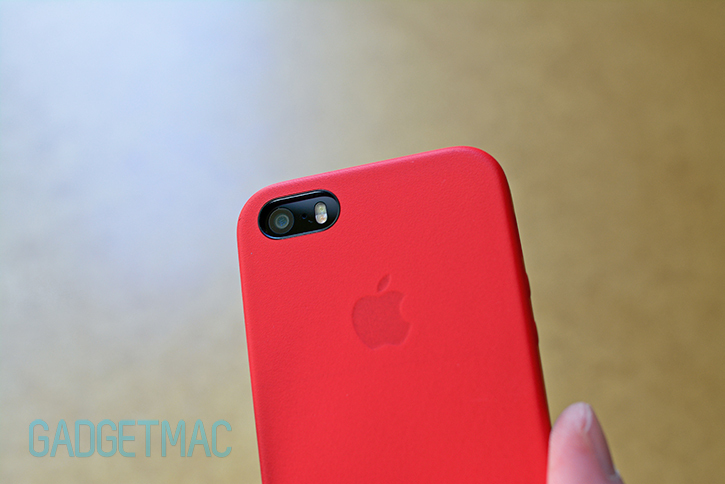 Apple thought about every little detail that makes a case great when it designed both of its cases for the iPhone 5s and iPhone 5c. And like always, left out the frills and kept things basic but functional. The back I'm afraid isn't as interesting as the front appears to be. The solid, flat design of the iPhone 5s Case is just that, minimalist yet good looking too. While the case does cover up the iPhone 5s's amazing aluminum two-tone body and with it any remaining clues that you in fact own a gold iPhone 5s, it should be admired for its simplicity and nothing more. But worry no more, there's still an Apple logo embossed in the leather right where the iPhone's native logo would have otherwise appeared. 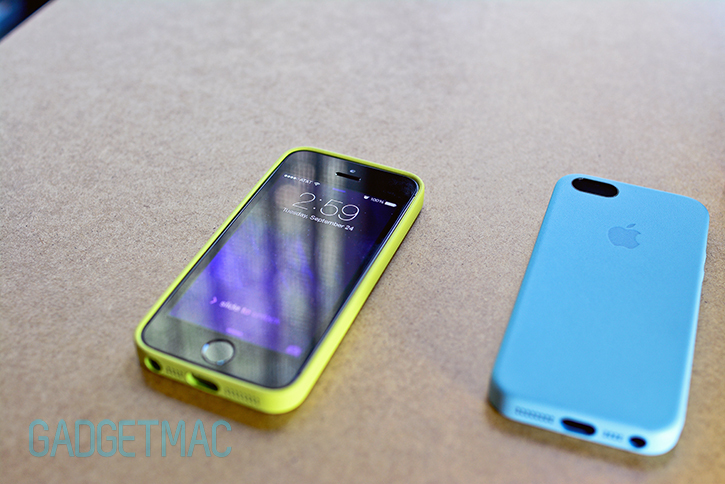 The iPhone 5s Case's slim profile, simple tight-fitting design makes it feel like it's part of the iPhone 5s. It fits comfortably in the hand, more so than holding the iPhone 5s or 5 without it on which says a lot. But even so, you still get that same slender blocky feeling when you hold your iPhone in the hand just with a little more care once the iPhone 5s Case is on. The smooth leather, subtle rounded corners and edges and overall refinement of the iPhone 5s Case give you a pleasing experience when using it. Getting to the various cutouts around the iPhone 5s Case we can see that Apple has made sure to properly outline the back-facing camera cutout with a black plastic ring which helps avoid any color washouts when taking photos at night using the iPhone 5s' True Tone dual-LED flash. You'll notice that like the iPhone 5c Case, the leather-made iPhone 5s Case also features these brilliantly executed precision perforated micro holes covering the iPhone's speaker and mic. The case's cutout for the Lightning connector port is wide enough to fit every single third party connector, however, the cutout made for the 3.5mm audio port isn't as generous and will only accommodate ultra-slim connectors. The same can be said about the pill-shaped cutout for the silent switch which is really tight and not the easier to reach without a fingernail. Buttons are integrated into the leather of the case and allow for pass-through button pressing without much effort whilst preserving the tactile feedback of each individual button as you would expect from an Apple-designed protective case. Trouble is though, Apple failed to make its official Lightning dock for the iPhone 5s compatible with the iPhone 5s Case, and the two live on to be foes. 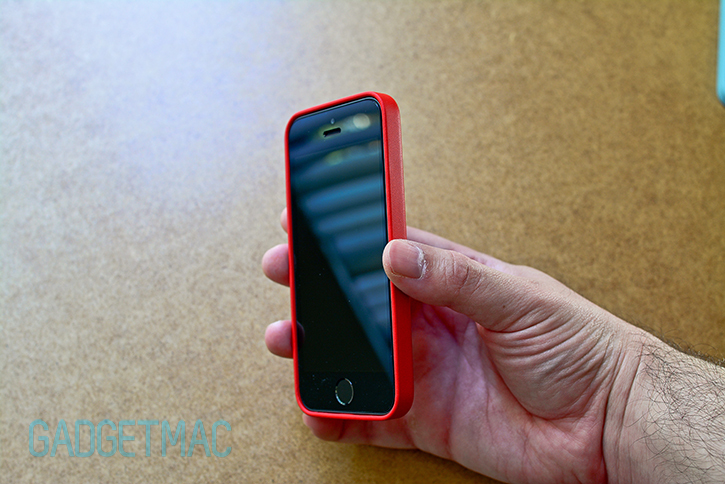 So how does one of the slimmest leather cases for the iPhone 5s and iPhone 5 rank in our book? Well, we're not overly impressed by Apple's official case but we like it enough to recommend it to anyone looking to get a minimalist genuine leather case to protect their device with a feel-good and likeable design. If you haven't upgraded to the iPhone 5s and you've got the iPhone 5 but still fancy yourself one of them official leather cases Apple put out, you can and you should. With a precise fit and a complimenting, albeit mundane design, the iPhone 5s Case offers little for what it costs you yet it's a hard case fault it otherwise. And although it isn't as luxurious as some other leather cases on the market, we think that for $39 it's a pretty solid option that feels considerably more premium than Apple's iPhone 5c Case. But if you're looking to indulge in something truly luxurious, Vaja and CalypsoCrystal are just two alternatives we can highly recommend. If these three vibrant colorful hues haven't done enough justice in presenting it as a luxury leather accessory, the fact that the iPhone 5S Case is also available in more mature and formal leather flavors like black, brown and light beige certainly adds more value using it alongside a best-in-class device that is the iPhone 5s.